Caesar’s Palace must have been feeling a bit left out, what with all the talk of new multi-billion hotels going up all around it. So they decided to join in the fun, and have announced a new $1 billion extension to the property, which has just been approved. 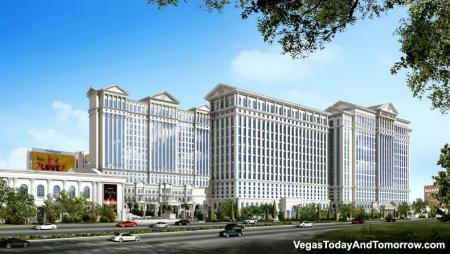 Read on to see what Caesar’s Palace’s new extension will contain. For the money, Caesar’s are adding a new 29-storey 1,017 room tower that will rise 350 feet, and which will frame (or dominate!) the existing pool area. As you can see from the renderings, unlike the existing towers, the new one will be less decorative – indeed, bland might be a better word! Hopefully the finished product will look better than this. Caesar’s are also adding more casino space – 37,000 square feet more in fact – as well as more restaurants, convention centre space and yet more shops. 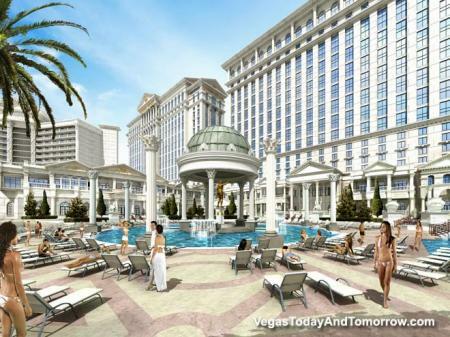 There will also be a new pedestrian promenade that will feature decorative fountains and landscaping to lure the passing walker into the depths of Caesar’s Palace (well, the casino, anyway!). 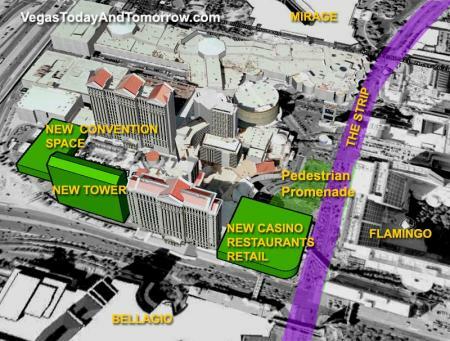 Underneath this new promenade, a garage will be excavated, with room for 389 valet-parking spaces. I’ve always liked Caesar’s Palace form the inside, as its combination of themed shops (the Forum Shops) and sprawling casino makes it a really interesting place to be. It’s one of the more extravagant hotels (not that any of them are subtly, you understand! ), and contains features that make your jaw drop. The huge wooden replica of the Trojan horse, for example, which stands proudly inside the Forum Shops, but which is actually just an extra bit of shop space for teddy bears for a toy store! Like I say, extravagant! 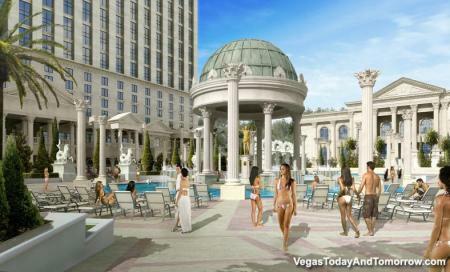 Outside, though, Caesar’s is a bit of a concrete jungle, with only the fountains breaking up the endless monotony of concrete, which conspires to blind you in the Las Vegas sun. Adding yet another large slab of concrete in the form of the new tower certainly won’t be adding anything to the attractiveness of the Caesar’s complex.